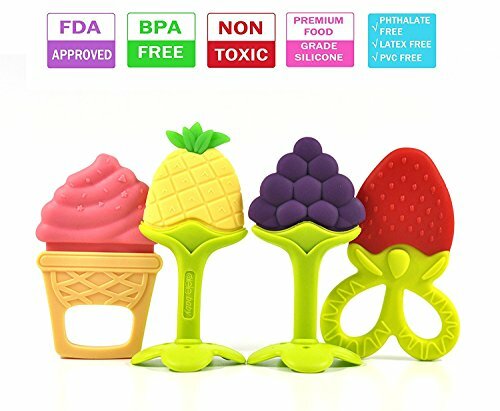 100% natural food grade silicone,FDA approved, BPA-free, toxin-free.These four teethers have been designed in conjunction with the best features of most gum massagers. Fit perfectly in baby’s hand to grip and their mouth size. Various appealing texture and bumps to relieve pressure on the baby’s gums. Easy to store and wash, dishwasher and freezer friendly. WARRANTY GUARANTEED- Your baby’s safety is our priority. Our products are factory tested and we are confident you will absolutely love them. If you don’t, please let us know and we promise a 100% money back guarantee.